Published: Sept. 12, 2018 at 03:32 p.m. 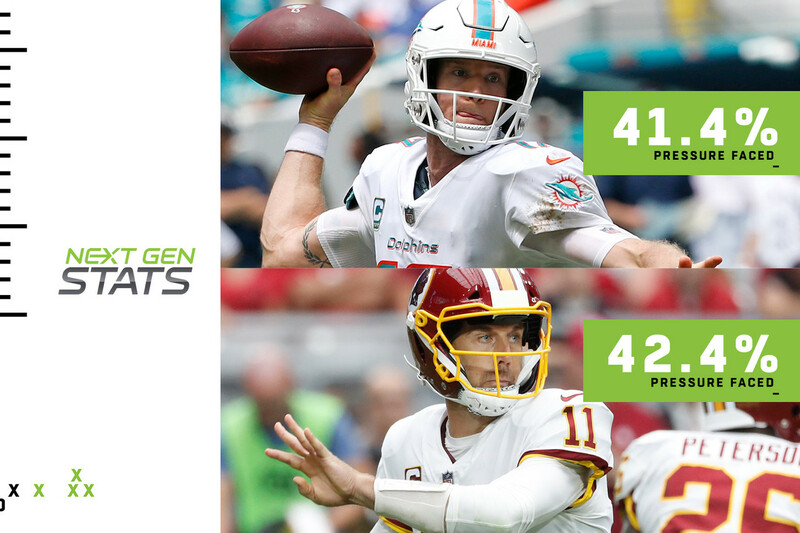 Updated: Sept. 12, 2018 at 08:05 p.m.
Two QBs shined under duress in Week 1: Miami's Ryan Tannehill and Washington's Alex Smith. Tannehill faced pressure (2 yards or less of separation from nearest defender when releasing a pass) on 41.4 percent of his 28 attempts, yet still completed 20 for 230 yards and two TDs. Making this line even more impressive: The fact he threw into tight windows (receiver separation of less than or equal to 1 yard when attempted) on 25 percent of his attempts, and completed 7.1 percent more of his attempts than his expected completion rate of 64.3. (Expected completion rate = likelihood a pass is completed based on a number of Next Gen Stats, ranging from air distance to receiver speed.) Tannehill's two INTs show he wasn't perfect, but the previous figures are notable. Smith completed 21 of 30 attempts for 255 yards and two TDs while facing pressure on 42.4 percent of his throws. His receivers were more open, with just 10 percent of his attempts directed toward tight windows. Two rushers jumped off the stat sheet in Week 1 when it came to rushing against a loaded box: Houston's Lamar Miller and Washington's Adrian Peterson. Fifty-five percent of Miller's 20 carries came against a loaded box, yet the Texans back still rushed for 98 yards (4.9 yards per carry). There was an average of 0.5 defenders more than blockers on his carries, making his average gain even more impressive. Peterson's nice Week 1 (26 carries, 96 yards, one touchdown) came against a box that was loaded on 50 percent of his 26 attempts, with an average of 0.58 more defenders than blockers. Not a bad afternoon for "All Day." Despite posting a respectable 122 yards on the ground, New England's rushing attack left plenty to be desired in Week 1. The Patriots didn't take advantage of opportunities. One-hundred percent of James White's five carries came with a blocking advantage (an average of 0.2 more blockers than defenders), yet he gained just 18 yards (3.6 per carry). Teammate Rex Burkhead struggled in similar fashion, with 88.9 percent of his carries coming with a blocking advantage (average of 0.39 more blockers than defenders in the box). Burkhead gained just 64 yards on his 18 attempts for an average of 3.6 yards per carry. Burkhead also gained 10-plus yards on only one carry -- a 12-yard gain late in the third quarter against a defense with seven men in the box, but with an offense that had nine blockers available. In a callback to last week's photo essay, we're taking a look at Tyrod Taylor's time to throw. Next Gen Stats revealed Taylor's average time to throw (2.72 seconds) would be slightly faster than former Browns starter DeShone Kizer (2.84 seconds), but this wasn't the case in Week 1. On a sloppy day in Cleveland, Taylor was noticeably slower in the pocket -- so much so that his average time to throw dropped to a flat 3 seconds. Only eight quarterbacks were slower to throw on average in Week 1, with just two non-mobile passers landing in the group: the Bills' Josh Allen (3.72 seconds on 15 attempts) and Jets' Sam Darnold (3.26 seconds). If Cleveland wants the offense it imagined it'd be getting with Jarvis Landry and Josh Gordon, Taylor must be quicker. He'll get that chance in the climate-controlled environment in New Orleans this week. Pittsburgh's T.J. Watt was all over the field on Sunday, recording 11 tackles and four sacks. Two of those tackles were considered hustle tackles, and his effort wasn't finished there. Watt's average time to tackle exceeded five seconds, meaning he was working extra hard to get to the ball carrier. And his sack rate of 14.8 percent (on 81 snaps) was the second-highest of any player with two or more sacks, with only Baltimore defensive back Tavon Young (two sacks) recording a higher rate at 40 percent. Related: Houston defensive tackle D.J. Reader and Cleveland defense end Myles Garrett recorded the two fastest times to sack. Each finished with two sacks, with Reader getting to the quarterback at an average of 3.47 seconds and Garrett at 3.59 seconds. Wade Phillips has a defense to be proud of, according to Next Gen Stats. A "hustle tackle" is when the defender traveled 20 or more yards before making the play. Three Rams ended up with four or more hustle tackles in Week 1 against Oakland, with linebacker Cory Littleton recording six, safety John Johnson adding five and corner Aqib Talib finishing with four. Carolina's Luke Kuechly and Green Bay's Kentrell Brice tied Littleton for the league lead with six hustle tackles in Week 1. Kentrell Brice's extra-effort night (SEE: the hustle stat just above) came as part of a Green Bay defense that deployed an unusually large amount of defensive backs against Chicago, trotting out a dime package (six defensive backs) on 27 plays, a dollar grouping (seven defensive backs) on 15 plays and a nickel package (five defensive backs) on 15 plays. In all, Green Bay used a defense with five or more defensive backs on 81.4 percent of its snaps Sunday night.